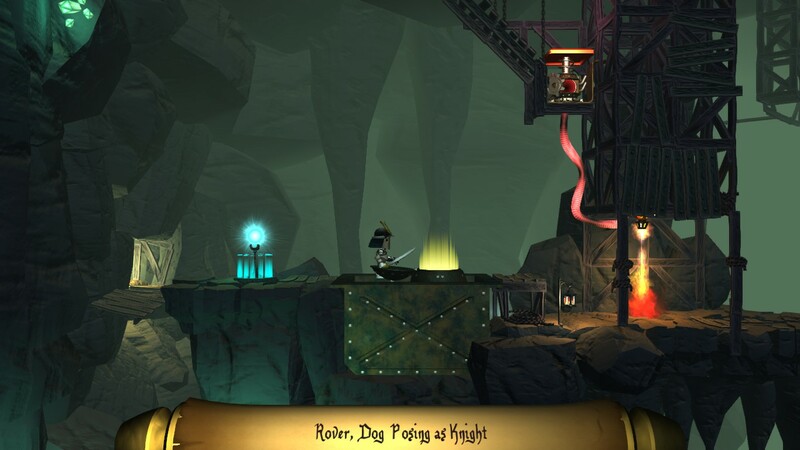 Life Goes On: Done to death is a platformer puzzle game with a dark sense of humor, published on Steam in April 2014 by Infinite Monkeys Entertainment Ltd.
A king with an obsession with immortality sends the brave knights of his kingdom on a quest to find the Cup of Life. 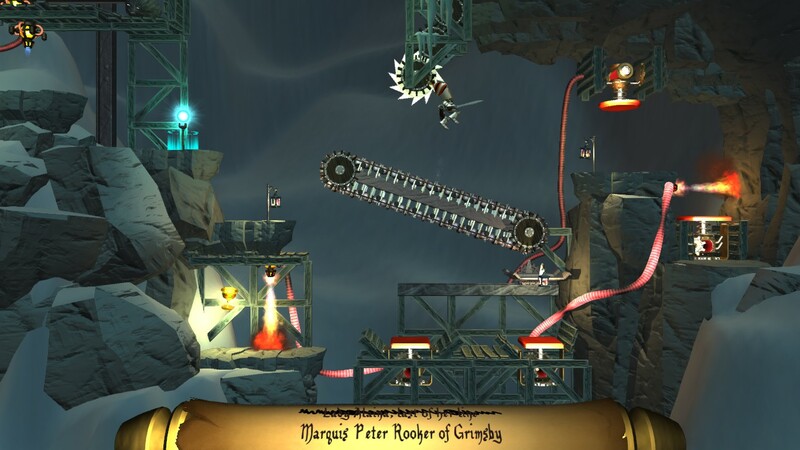 There… is clearly a reason why this immortality-obsessed king didn’t go on the quest himself, since the path to the cup is so dangerous that it leaves a steady trail of dead knights, and each knight only makes their way through the obstacles by using the corpses of the knights that came before them as puzzle-solving tools. At the end of each level is a cup, but it never seems to the Cup.. Using bodies as stepping stones to cross spike pits, to weight down switches, or to scale spike walls, new puzzle components are added every few levels to keep things fresh, though the game felt too drawn out at times so that the level felt somewhat repetitive. The final boss fight of the game is probably one of the favorite I’ve played in a while, several stages in itself all using the puzzle components you’ve learned throughout the game and using them in a boss fight scenario. Especially fun. Fun and fine for what they are, perfect for a comedy puzzle platformer like this. Played it muted most of the time–sound is at least not necessary to play. Decent puzzle challenge. I finished the game without having to look up any of the solutions–a few of the puzzles took me quite a few tries, many of them I got the gist of how to work through them in the first few minutes on the level. Not epicly challenging by any means, but also not trivial. The puzzles add new components as the game goes on which helps keep things fresh, though sometimes I felt like there were too many levels before adding new components, some of the levels started feeling a little repetitive. Very minor level of story, though it works for what it is–between the levels the level map there are little bits of extra text talking about the story, mostly for some extra pieces of comedy. Most levels, once you know how to solve them, should take only 2 or 3 minutes to finish. Add to that a few more minutes to figure out all the pieces of the puzzle, and most puzzles you can solve without too much agonizing. If you quit in the middle of the level you have to start the level over again, but since the levels are reasonably short that’s not a huge deal. Easy controls, just movement and jumping. The challenge is more in figuring out the puzzles and then making sure you do all the steps in the right order and timing and etc. There is some replayability built in, mostly in having target stats for each level–minimizing finish time and body count, as well as whether Jeff was fed. Felt quite original. In a familiar genre, but the dark-funny premise of having a steady stream of knights sent to their death and then using their corpses as puzzle components. Steam says it took me about 16 hours of playtime–I feel like that’s longer than it took, maybe I left the game on a few times. But the game did feel like it dragged on sometimes, more levels than were needed to get all the puzzle variants in. This game was fun and funny with enough novel puzzle elements and interesting premise, well worth it for fans of puzzle platformers. I thought the number of levels did go on too long so that the puzzles felt repetitive at times. The final boss battle of the game was a major highlight, probably one of the most fun boss battles I have played. $12.99 on Steam.